Zucchini, Sautéed, Celery, Thyme for Cooking easy summer vegetables. A quick fry of shredded zucchini with crunchy celery, flavored with tomato and soy sauce and a bit of spicy chili powder. The chili powder is sautéed briefly to release more flavor. Shred zucchini using large holes on box shredder - or however you want to do it. Heat oil in medium, nonstick skillet over medium heat. Add celery, chili powder and sauté 2 minutes. 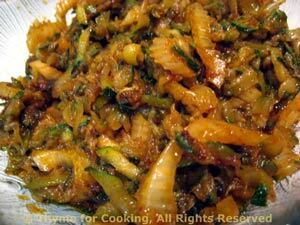 Add zucchini and continue to sauté for about 15 minutes, stirring occasionally. Mix the ketchup, soy sauce and water and drizzle over the zucchini. Stir well to mix and continue to cook until zucchini is dry again and starting to brown, another 2 - 4 minutes.